It’s only fair the two best teams all season play out the NRL Telstra Premiership Grand Final. The Sydney Roosters, and the Melbourne Storm do battle over eighty minutes to see who will hold up The Gladiators Provan-Summons Trophy. The Roosters, also claiming the J J Giltinan Shield and the Minor Premiership were destined for greatness in the pre-season. Key signings of Cooper Cronk, and James Tedesco saw their odds of winning the whole thing increase tenfold. Melbourne’s success in 2017 was unprecedented. Undeniably the best side of the competition. They’ve now backed up that incredible success to try win back to back Premierships for the first time since the Brisbane Broncos of 1992 and 1993. That Broncos Broncos side is very similar to the juggernaut that is Melbourne, as is the Raiders of the late 80’s and early 90’s drawing similar comparisons to the Sydney Roosters. What’s even more impressive, is that of the last twenty years of twenty years of National Rugby League Grand Finals, 14 of which have had either the Storm or Roosters contesting it. Quite remarkable, in the modern day era to have such dominant forces back up again and again. Especially with the salary cap. All league fans will know that the Roosters season did not start as promising as it was supposed to. That also goes for Melbourne. It was the Panthers, Dragons, Tigers, and Warriors who turned heads across the first ten weeks of the competition. The run home was timed perfectly by both these sides, you could almost put your house on it. Coaches Trent Robinson, and Craig Bellamy have made sure their troops were in their prime for when it mattered most. 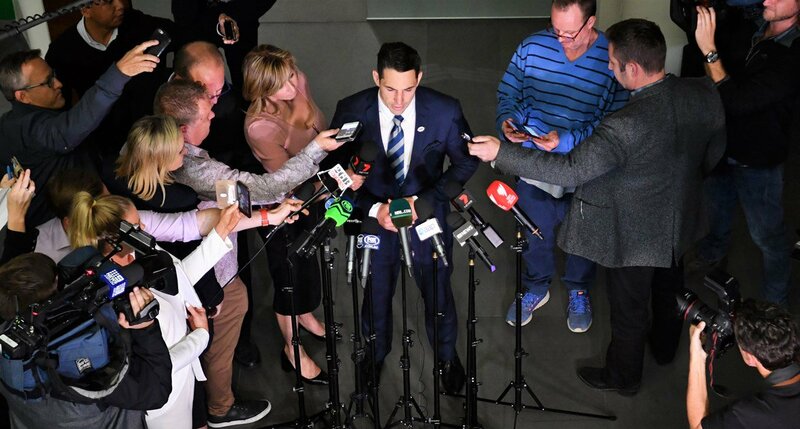 The media this week has all been about the focus of Cooper Cronk. Will he? Won’t he? Named in the 23 jersey on an extended bench, it’s hard to see this warhorse make it after suffering a bad AC Joint injury in their Grand Final qualifier. And then there’s Billy Slater, who has been set up to play out a fairy tale finish after beating a shoulder charge suspension at the judiciary on Tuesday night. Much to the delight of the Storm faithful. These two were almost identical when it came to statistics this season. The Roosters averaged 22.6 points per game, while their purple rivals sat at 22.3 point per game. The tri-colours averaged 15 points conceded per game, and Melbourne 15.1 points. Their last clash was in Round 16, in Adelaide. The Storm won a 9-8 thriller. What makes this grand final such a scintillating affair is the stacked amount of talent across both sides. It’s James Tedesco versus Billy Slater, the new against the old. New South Wales versus Queensland. Try scoring machines Daniel Tupou, and Blake Ferguson square off against thrill machines Josh Addo-Carr and Suliasi Vunivalu. The world class Latrell Mitchell, having the season of his life, and up-and-comer Joseph Manu will do their best against the dangerous Will Chambers, and Curtis Scott. There is a lot of points on offer in these ten names along. Freakish amounts of athleticism, pace, and ability between them. Mr. Fix-It Mitch Aubusson and young gun Luke Keary are set to be the halves for Easts, against the cool, calm, and collected Cameron Munster, and rookie Brodie Croft. Then the battle of the forwards sets up a mobile, yet physical presence across the field. Jared Waerea-Hargreaves, Jake Friend, Siosiua Taukeaiho, Captain Boyd Cordner, Isaac Liu and hit man Victor Radley square up against the tireless Jesse Bromwich, Captain Cameron Smith, Tim Glasby, enforcer Felise Kaufusi, Joe Stimson, and Dale Finucane. The Roosters bench has Dylan Napa, Zane Tetevano, Paul Momirovski in just his third premiership match, and Ryan Matterson. Melbourne’s has Kenny Bromwich, Christian Welch, Brandon Smith, and Nelson Asofa- Solomona. Wow. If these men can be separated on paper, I’d love to see it happen. There’s a premiership on offer, a legacy, a chance to go down in history, and these blokes are the upper echelon of incredible. This is why they’re here. Melbourne’s strength lies in the ruck. They, for so long, have been the bench mark when it comes to the wrestle, and slowing opposition down. They’ve done it better than anyone else, and look to do it one more time in another crucial match. Sydney Roosters love to eat metres. Their outside backs to an incredible amount of work. In his last season as a Rooster, Blake Ferguson has impressed in every match, with an average of 198 metres a match. I really am at a stretch to pick a winner. There’s so much to look forward to in this match, as a neutral fan – this is the two best teams, hopefully treating us to one of the greatest grand finals in history. I’m picking the Roosters defence to be the clincher for me. They’ve been under plenty of pressure in different situations throughout the year, and more or less handled it very well. If this game is locked with ten minutes to play, then you’d have to back the Melbourne Storm to get the result. My key match-up lies between Latrell Mitchell, and Will Chambers. The Roosters left centre is having a barnstorming season, and with a certain Kangaroos jersey waiting for him against Tonga on October 20th. Will Chambers is a veteran who never backs down from a challenge, a player who thrives in these tense environments. Whoever makes the most of their chances between these two – who ever really makes a statement in the NRL Grand Final, will also walk away with the Clive Churchill Medal for best on ground. I’m tipping the Bondi boys, the Sydney Roosters to win in a thrilling 16-10 win. I’ll take Boyd Cordner as first try scorer, too.